Hooking rugs is a simple craft that you can easily teach yourself. The early settlers to North America hooked their old clothing on to burlap bags as a way of warming cold damp floors. It is an environmentally friendly craft� that recycles old clothing and cloth scraps. It requires no energy sources but your own hands, and is a beautiful meditative craft that you can do as the world goes on around you. 1. Put your pattern onto an embroidery frame or quilting hoop. It should lie flat and be tight like a drum. As you hook, keep your burlap tight on your frame as this makes the hooking quite a bit easier. 2. Your wool should be clean and ready to use. You can cut it into one quarter to one half inch strips. A simple method for cutting wool is to take an eight-by-four inch rectangle of wool cloth, fold it accordion-style, and cut it into strips. This saves a lot of time and works best with five-and-a-half inch scissors as they have a shorter blade. 3. Take a strip of wool and hold it underneath your pattern. Take your hook, holding it in your hand as you would a pencil. Put the hook through a hole in the burlap, wrap the wool around the hook on the underside of the burlap, and pull the end of the wool up through the hole. Continue doing this with the same strip of wool, pulling it up loop by loop to the top side of your pattern. 4. It is a good idea to start by outlining something near the center of your pattern. 5. Continue to hook in every second or third hole, depending on the width and thickness of your wool. When your strip is used up, pull the end of the strip to the top side of your pattern, and clip the end so that it is an even height with your loops. Your loops should be one quarter to one third of an inch in height. 6. You can hook in straight or curved lines. Be careful not to cross the paths of your wool on the back of the pattern. Always clip your wool and start in a new place, rather than carrying a color across the back of your mat because this will make your rug bulky, messy and easy to pull out. 7. Continue to hook, by outlining and filling in all the areas of your rug. Do not hook too tightly or your mat will not lie flat. It is the packing of the loops together that keeps the loops from falling out, but if you pack it too tightly your rug will curl up. 8. There are many ways of finishing the edges of a rug. You can sew by hand black cotton twill tape around the outside edges of the rug. Hook right up to the twill tape, or sew it on after the rug is hooked. When your rug is complete, you can roll two inches of the excess burlap into the twill tape and hand sew it along the backside of your rug. If the rug is going on the wall, you can fold the excess burlap along the back side of the rug, and sew it up. I like to press the rug with a hot iron and a wet cloth. This is called blocking the rug and it helps give the rug a finished patina and even out the loops. 9. When you hook, try not to go from left to right but cover many parts of the rugs area in case you should run short of wool. If you do this you can always add more wool of a slightly different color to complete your rug. It may even enhance the primitive quality of your design.10. Hooking rugs is meant to be a pleasant pastime. To avoid getting sore shoulders or hands, take lots of breaks, and make sure you are sitting in a comfortable position and that your body is relaxed. If you are comfortable, relaxed, and have support for your back, the hooking will go along much more easily. all ends come to the surface and you cut them off, even with the loops. Try holding the wool flat between your gongers under the frame. Help. I just started wool hooking and am having trouble pulling the loops through w/o the wool strips raveling. What am I doing wrong? You can hook anything. I prefer wool because the edges are smooth. Though if edges are messy it can still look great. I just started rug hooking and am just practicing. I’ve tried cutting and tearing the wool, but the edges look so messy either way. Lots of loose threads. What am I doing wrong? Also, can I use other fabric, especially cotton? I think it is good to block it. I push up against the outline. You It should be filled in nicely. I am a beginner and have just finished my first outline. My question is how much space do I leave between the outline and the “fill” line (and all the other fill lines). I have been doing every other on the outline but if I leave a space between the outline and the fill as well, burlap is visible and that doesn’t look right. Thank you!! I’ll do that in a post! Deanne, can you address what you do when you get ‘stuck’ on what to hook next? so many project ideas but tough to focus…. What are your suggestions for someone wanting to get started as far as purchases are concerned? I know I need some sort of a frame, but there are many. I see several different hook choices as well. Lots of options = confusion for me. great. 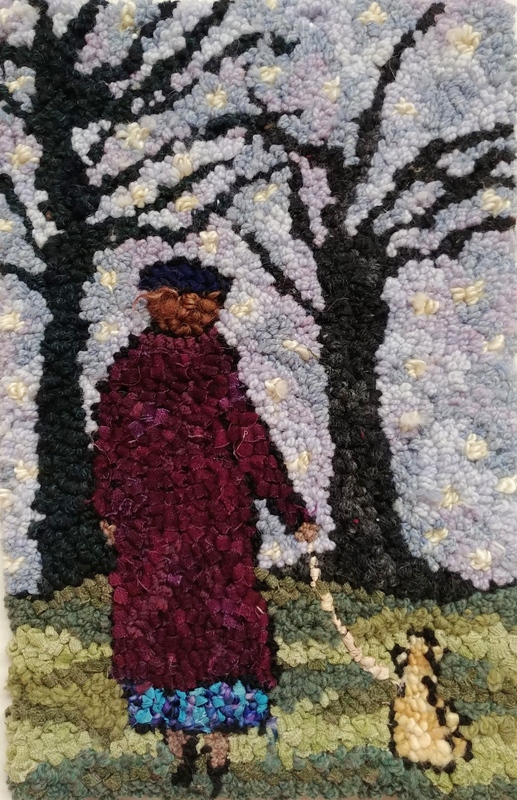 My own mother took a sixty year break from rug hooking, and made more than a dozen mats after that. Thank you so much for your clear description and pictures. I haven’t hooked for over 50 years but now retired, I really want to get back to it. I inquired re a class here in the city last year, but the cost was too high 100.00, plus materials for this senior’s pocketbook. I now have a new project to begin very soon. FREE SHIPPING! Beginners Starter Pack! LEARN ABOUT RUG HOOKING WITH DEANNE ONLINE! Stormy Sunday: January 20, 2018.